I have seen a few feed bag totes floating around the interwebs recently and when it came time to find a project for one of our Farmgirl Chapter meetings, I thought this would be lots of fun for everyone. All you need is a feed bag and some creativity. I am not sure what the bag material is called but it is like a plastic-y/nylon woven bag that makes a lot of crinkling noise when you touch it. How's that? Anywho, I like the simplicity of the bag I found, it was just five dollars and I could actually use the feed. Here is my completed bag. By the way, this is the first photo I took after the whole water-logged camera debacle. Each photo has gotten better so I think my dear is going to be fine. Whew. I bought the navy gingham fabric and made the ruffle bit and the white ruffle on top is some trim I picked up at the store. I was going to buy some nylon mesh for the handles, but I decided to go with this navy linen-like fabric I had from one of my scrap boxes and just make my own handles. I had some of the navy gingham left over so I made a flower out of it and covered a button for the center using some more fabric out of the same scrap box. I really should share a photo of that box sometime. It is a box from my grandma so it has scraps from clothes she made when I a child. Very fun. Anyway, here is the "flower." Here is a shot of some of us farmgirls showing off our bags! you all look great with your country feedbag totes... Of course the ruffles and medallion on yours are the bomb. Thank you for sharing pictures of your project! 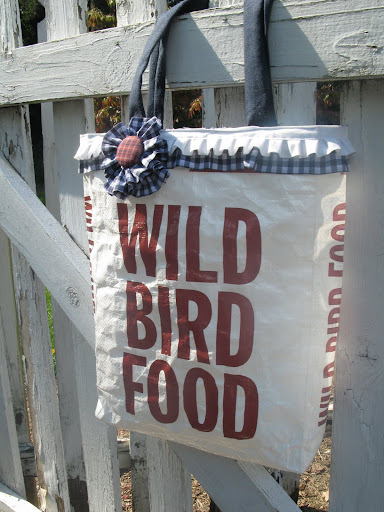 I was just googling trying to get ideas to make a similar bag from my chicken feed bags. Looks great!